On Friday, Oct. 17, was introduced by Uruguayan Football Association (A.U.F.) oficially for the first time, the new digital board of Colombes Grandstand of Centenario Stadium. The board is made with latest generation, it is new and has 60 panels of 96 centímetrs from each side, making up a screen with just over 55 square meters with 9.60 meters long and 5.76 high. 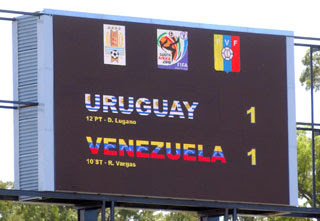 While the board reached Uruguay without cost donated by Venezuela after negotiations with that country during the Copa America 2007, Uruguayan Football Association (A.U.F.) and C.A.F.O. (Managing Committee of Official Field) had to spend about $ 100,000 to build the support and a laying of optical fiber from the board until the cabin in which it is controled. 23th 2005, which had wind gusts of up to 174 kilometers hour. problems delayed its entry into operation and it is estimated to be interfered with on Sunday November 30, 2008, on occasion of the uruguayan derby Peñarol-Nacional.